Home staging with furniture is one of the most basic and universal of all property enhancement techniques. Furniture is an important part of the aesthetic appeal of any house or apartment and is one of the main factors considered when classifying the interior style of any residence. When working with furniture during home staging, it is crucial to maintain a pleasing and cohesive look and feel, as well as optimizing the flow of the home to maximize perceived space and functionality. This simple tutorial explains the best way to stage furniture in any style of residential setting. 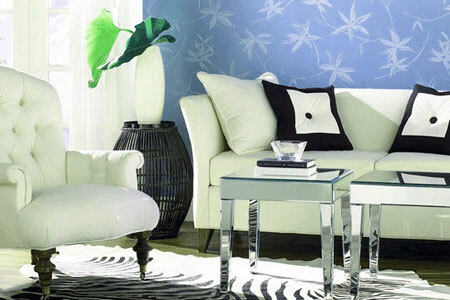 Selecting furniture for a project may be limited by the home staging budget that is available. New furniture can be purchased or rented, but many sellers choose to re-use some or all of their existing furnishings in order to save money. Furniture rental is one of the most common niche industries of the staging business, allowing clients to diversify and update their décor without significant expense. Just remember that you will be responsible for maintaining the rented furniture that is placed in your home, so be sure to talk with your stager about repair and replacement costs if you have young children or pets. Choosing furniture for a space is all about placement, style and size. Proportion is really important to consider in any room, since inappropriately-sized pieces of furniture can make a room look odd, empty, cramped or downright ugly, depending on the particulars of the space. My general rule is to size most pieces down, except in the largest of rooms and declutter by removing extra furniture and accessories for a clean and organized look. The style of the furnishings should be appropriate to the architecture and should optimize the inherent charm of the space. I generally recommend a contemporary or classic-contemporary style for most properties, since this look is easy to achieve and appeals to most new buyers. Furniture is not usually sold with a home, but it is crucial to give a prospective buyer a good idea how the space can be used once they move in. Empty space looks blank, cold and compressed. Most buyers will not be able to judge the true size or usefulness of any vacant room. A successful home staging design will use furniture and other details to bring out the best features in your residence and show buyers how well the space can be used for their own furnishings. Remember that there are many fast fixes for saving money by using your own existing furnishings. Slipcovers, new hardware and paint can turn almost any old or worn piece into something new and exciting. To learn more about the many benefits of home staging and how furniture can become a valuable selling asset, consult with a home stager today.